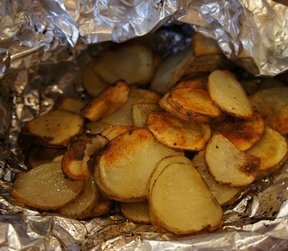 These potatoes are great grilled and served next to a steak! A must for camping trips! 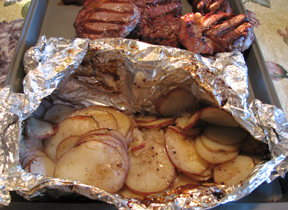 Use 2 large pieces of aluminum foil and set them out on the counter. 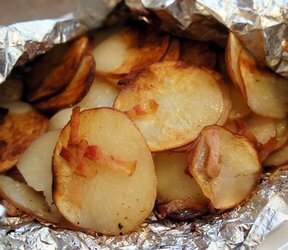 Slice potatoes thin and divide between the 2 pieces of aluminum. Chop or slice onion and set on top of potatoes. Top with several pats of butter. Top with any seasonings you like, I use garlic salt, fresh ground black pepper, and Johnny's Seasoning Salt. Seal the edges by rolling and pinching the foil the long way, then roll the sides to seal. Grill on medium heat or over a campfire for about 45 minutes. Check them after 30 minutes.